Note! Spindle version 2 is out. This page documents Spindle version 1. Independently developed demo parts can be chained together easily, in any order, facilitating exploration of the design space in order to arrive at a rough cut. Spindle then assists the coder by suggesting where and how filler parts could be crafted to improve the loading process. A visualisation of block demand and memory usage over time provides further optimisation hints. Spindle is equipped with a cutting-edge IRQ loader featuring scattered loading, state of the art serial transfer routines and GCR decoding on the fly. The compression scheme is optimised for extremely fast scattered decrunching, at the cost of sub-optimal compression ratio. As measured on a private build of my demo Shards of Fancy, the average compression ratio is 45%, not counting internal fragmentation. Currently, only single-side trackmos are supported. The data is laid out to minimise seek times: The first demo part is located near the middle of the disk, and the following parts are stored in order from outer to inner tracks. Directory art can be supplied in the form of a text file. While Spindle uses its own D64-compatible storage format, it respects and coexists with the native commodore disk structure, so demo disks can be adorned with noters and other auxiliary files using standard tools like c1541. Go ahead and use this in your demos! You can include the spindle logo (example/spindlelogo) if you like, but you don't have to. I would appreciate some credit though, e.g. "Loader by lft". For more information about the individual Spindle tools, please run them with the --help (or -h) option, and study the makefiles in the example directory. Declares that this demo part uses zero-page locations from FIRST up to and including LAST. For convenience, I usually keep all zero-page locations used by an effect close together, and declare a slightly larger range. You can use this option multiple times. "Safe I/O". Declares that any interrupt handlers used in this demo part are able to coexist with loading operations that access shadow RAM at $d000-$dfff. In practice, such interrupt handlers should back up the value at $01, store $35 into $01, handle and acknowledge the interrupt, and finally restore the previous value at $01. The Spindle runtime occupies 1 kB of C64 RAM at $c00-$fff, as well as zero-page locations $f0-$f7. I recommend that you stick to addresses $3000-$ffff while developing new effects. Personally, I tend to load code at $3000, and place generated speedcode and tables from $8000 and up, but that's a matter of taste. Later in your demo project, as you start optimising loading times, you'll be moving things around, so use labels! If any of sprites 3-7 are enabled, you have to compensate accordingly, of course. Spindle also enables raster interrupts and disables all CIA interrupts. All of the routines are optional: Supply a null pointer to make Spindle ignore a particular vector. In my experience, most new effects start out with just prepare, setup and interrupt. The fadeout routine typically does two things: It triggers a fadeout operation, usually by setting a global flag that affects the behaviour of the running effect. It also monitors the fadeout in progress, returning with carry set if the fadeout has completed. Mnemonic: "Carry" on with the next effect. If the demo part is main-less, fadeout is simply called repeatedly in a tight loop. Otherwise, Spindle alternately calls main and fadeout. Finally, the cleanup routine can be used to tear down the demo part in a controlled fashion. It is called while interrupts are still enabled, but you can put a sei instruction inside cleanup if this is desireable. You could, for instance, install a non-maskable timer interrupt in setup and disable it in cleanup. More commonly, you could use cleanup to wait for a particular rasterline before moving on to the next demo part. Loading is performed while the parts are running. Spindle prefers to load during parts that lack a main routine, but if necessary, it can also schedule some loading operations after fadeout returns with carry set, before the call to cleanup. In dire circumstances, Spindle may be forced to insert a blank part in order to do some loading (e.g. into the I/O range), in which case it will print a warning. A demo part may install a music player. Such a part would make a call from setup to the init routine of the tune, and also declare the address of the playroutine using the M tag. Please have a look at example/music/install.s for a minimal example. The interrupt handlers of subsequent effects should be fitted with a dummy three-byte instruction (e.g. bit !0), and the address of this instruction should be given in the last field of the .efo header. At link time (not runtime), Spindle will replace the dummy instruction with a jsr to the currently installed playroutine. This makes it very easy to move parts around in a trackmo with multiple tunes, and to move tunes around in memory. The dummy instruction remains if the part is scheduled to run even though no music player has been installed, which is always the case when the part is launched with pef2prg. Spindle assumes that any data chunk in a music-installing .pef file, apart from the first (the one with the .efo header), represents a global allocation of memory that should remain reserved until the music player is uninstalled or replaced. Subsequent parts implicitly inherit the contents of those memory pages. This is normally what you want, but it will generally prevent you from installing a music player as a side-effect in a demo part that also does something visually. Please let me know if this is a problem. For robustness, the music-installing demo part must have a null callmusic field, and must itself provide either an interrupt handler with a regular jsr to the playroutine, or a dummy interrupt handler such as "lsr $d019 : rti". A null interrupt vector would tell Spindle to use the interrupt handler from the blank effect, which in this case would make calls to the previously installed playroutine. The number in the second-rightmost column indicates how many sectors (of compressed data) are loaded during this part. As a general rule, Spindle tries to load everthing as early as possible. This behaviour is often what you want, and if not, it is very easy to modify by adding false page-used declarations (P tag) to parts. Furthermore, the X tag can be used to minimise the loading that takes place during a part. 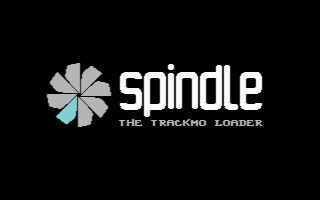 This has been done for spindlelogo.pef in the example, because it is more interesting for the audience if the bulk of the loading occurs after the music has started. In the example, the 16 blocks loaded during spindlelogo.pef correspond to the LLLLLL and c segments of music.pef. After music.pef has been launched, Spindle loads 85 blocks comprising the L and c of ecmplasma.pef and most of the L segments of lft.pef. However, it cannot load into the memory range already occupied by the ccc of spindlelogo.pef, because this memory is still in use: Since the video matrix and font of spindlelogo.pef remain visible during music.pef, the corresponding memory pages have been declared as inherited (with the I tag) in music.pef. Once ecmplasma.pef is up and running, Spindle loads and decrunches five more blocks into this area. Depending on the demo, the brief black intermission might not be a problem. Another way of addressing the problem, as is visually clear from the chart, would be to relocate all of spindlelogo.pef to $3000 (and adjust the inheritance declarations in music.pef). But a third option is to follow the suggestion and add a filler part that doesn't interfere with the memory of its neighbours. Spindle lists all memory pages and zero-page locations that are free. Be aware, however, that Spindle currently doesn't track zero-page addresses used by the music player, so you have to take care of that yourself. For instance, my playroutine uses zero-page locations from $e0 up, so I just make sure to stay below that for effect code. By now you'll probably have noticed that some of the switchovers are glitchy. Where applicable, add cleanup routines to e.g. turn off interrupts and wait for a particular rasterline before allowing the next part to run. Take care to insert extra calls to the playroutine where necessary. To avoid hardcoding the playroutine address in such situations, I suggest copying (at runtime) the operand of the ordinary jsr instruction (which will have been modified by Spindle at link time) into a jsr inside the cleanup routine. See example/ecmplasma/effect.s. Unlike a traditional loader, Spindle does not rely on a centralised directory structure. 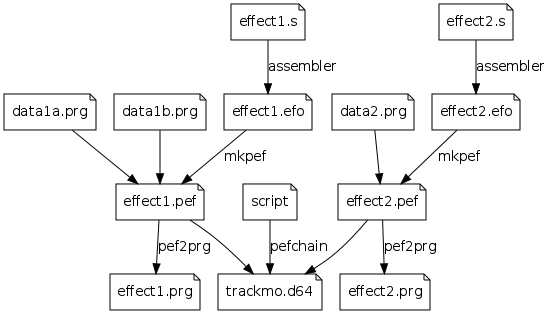 Demo parts are chained together into a linked list of files (sets of sectors), each of which contains a reference to the set of sectors to load next. A file does not correspond to a demo part. The chunks of each demo part may be split further (along page boundaries), and the resulting snippets are scheduled to be loaded at various loading slots throughout the trackmo. Spindle attempts to schedule each loading operation as early as possible, during a main-less demo part. If this cannot be done, data will be loaded immediately before the part in which it is needed, possibly in a blank part. All the data for a particular loading slot is compressed into a set of sectors, such that each sector can be decompressed individually. The cruncher is a simple (greedy) implementation of an LZ packer that stops as soon as the crunched data fills the available space. Every sector contains a destination address, the number of pieces of crunched data, a bit stream and a byte stream. Because the crunched data fits in a sector, the indices into these streams are 8-bit quantities, which speeds up the decrunching. Between loading operations, the Spindle runtime must drive one or more demo parts by calling the various routines supplied via the .efo headers, and monitor the transition conditions. The code responsible for this is generated by pefchain, tailored for each part, and resides (along with a specification of the next file in the chain) in a special handover area of 128 bytes. Every loading operation also replaces the contents of the handover area. Sometimes, 128 bytes aren't enough, and pefchain will inform you that you have to use the -H option to allocate a full page for handovers. I suggest staying out of page 2 while coding demo parts, just in case you'll need it for handovers later. I have some ideas about how to eliminate this problem in future Spindle versions. $c00-$d7f       Resident part of loader, handles serial transfer. $eec-$eff       File specification to bootstrap the first demo part. A file specification consists of a length byte, followed by that many track specifications. Every track specification consists of a track number and three bytes of sector flags. Also, one of the unused bits in the length byte is used to indicate whether some parts of this file will decrunch into shadow RAM underneath the I/O area. When this bit is set, the loader calls the decruncher through a small wrapper routine that performs the required bank switching. For every track in a file, the runtime transmits the track specification to the drivecode, and receives the corresponding sectors in random order. The drivecode doesn't verify the sector checksum, but transmits it along with the sector contents. The data on disk has been transformed so that the receiver must eor each incoming byte with the previous (which can be done at no cost compared to just receiving the bytes and storing them as they are). Since the final byte received is the sector checksum, the final eor operation is expected to set the zero flag. In the unlikely event that this doesn't happen, either a read error or a transmission error has occurred. The receiver reports the status back to the drivecode, and both parties act accordingly. If the checksum was correct, the receiver decrunches the self-contained sector into its destination address while the drivecode fetches another one. After every loading operation, the runtime transmits a special command to the drive to turn off the motor. After the final loading operation, a different command is used to tell the drive to reboot.